I spent the majority of the week reading Cold Days. I didn't pick up Aristotle and Dante until Saturday evening, but finished it by the beginning of the Super Bowl last night. 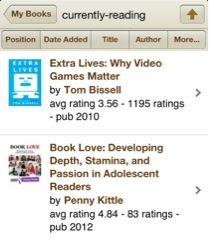 Very different books, but both get 4 stars from me on Good Reads and 4 hearts here! I've had Au Revoir since ALAN in November 2012, but haven't yet read it. It seems like a great book to book talk with my high school students. In my quest to read through more of my own library's graphic novel section, I'm reading the Amulet series. Each day at least one student asks me about volume 6. My middle school students really love this series so I want to know why! Yes, I've been reading these books for what seems like forever. In all truthfulness, the amount of time I've had lately for reading has been less and PD reading is the first to be set aside. I need to carve out some time to finish up both of these books. I really like both of them, but have only read small chunks of each. 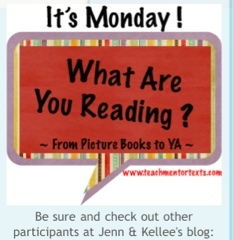 Happy Monday and happy reading to each of you! 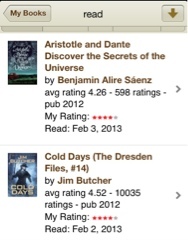 I've got Aristotle and Dante on board for this week. Glad to know it's easy to get through! I need one of those! 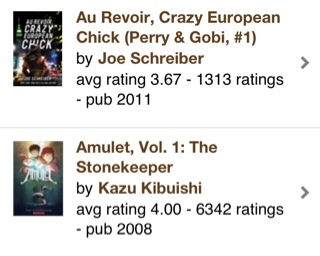 Amulet is so popular in my library as well and with good reason! It's such a great series. Aristotle & Dante is beautiful. Looking forward to reading your thoughts. Aristotle and Dante is on my list to read this year, after seeing it on ALA's 2013 Rainbow list. Move to the top of your pile! 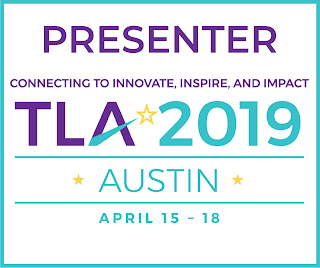 It received all kinds of recognition at the ALA awards! And I REALLY need my Cold Days back from my MIL! All of my students (and my son) LOVE the Amulet series! One of my goals for this school year is to read books 2-5. I'll probably try and read one each week until I finish up the series. My graphic novel bookworms LOVE the Amulet series! They are so passionate about it. I'm on a graphic novel quest this week so I can have some more recommendations for my kiddos. Just picked up 3 from the library today, and one more is on the hold shelf for me. I guess I better get started! Thanks for sharing! I'm reading my way through our GN section in the library. Always looking for more great middle/high school titles!